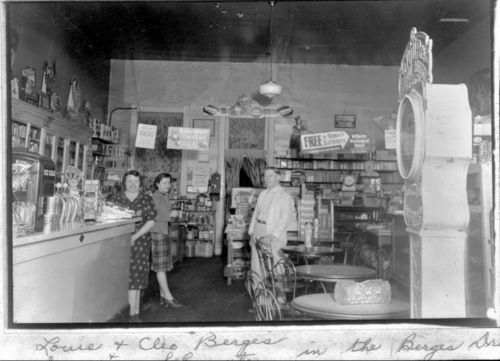 This photograph shows an interior view of Berges Drug Store in Onaga, Kansas. The people in the photograph are identified as Louie and Cleo Berges and Genevieve Schumate. A soda fountain is visible on the left side of the picture, and tables, chairs, a tall weighing scale, and various items for sale are visible in the rest of the picture. Holding Institution: Merrie Pinick, 1978.